The Kona International Airport (KOA) at Keahole occupies 3,450 acres of land approximately 7 miles northwest of Kailua-Kona on the Big Island of Hawaii. The Kona Airport has an 11,000-foot runway and a group of buildings at the eastern edge of the airfield for arriving and departing passengers and general aviation operations. The airport offers inter-island commercial flights and overseas domestic service. KOA Airport provides commuter/air taxi and general aviation operations, including helicopter operations. Automotive access is provided via a road extending from the Queen Kaahumanu Highway. An additional complex of facilities, used primarily by all of the rental car agencies for returns, general maintenance, and storage is located along the airport access road, midway between the highway and the passenger terminals. 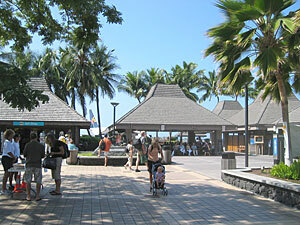 Typically, when arriving at Kona International, you can pick-up your rental car before getting your checked luggage. This will enable you to toss the bags directly into your rental car and avoid hauling the bags around while getting your car. 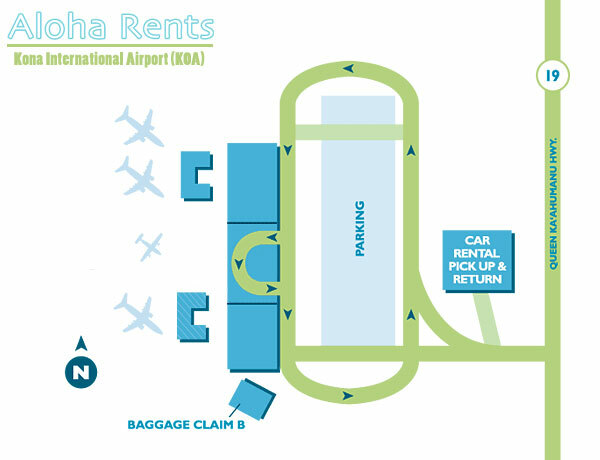 The Car Rental shuttle pick-up is located near the baggage claim area. I timed the ride last time and found it to be about 2-3 minutes. Make sure you keep track of the route. Quickly fill out your car rental agreement and take the quick drive down the hill and park in front of the baggage claim area. Get your bags and you are on your way! The shuttle for all car rental companies runs it's route every 5 minutes. This is a very quick process. Visit our Kona rates page or get a rental car reservation now. Check out Cheap Kona Car Rental on the Big Island of Hawaii.